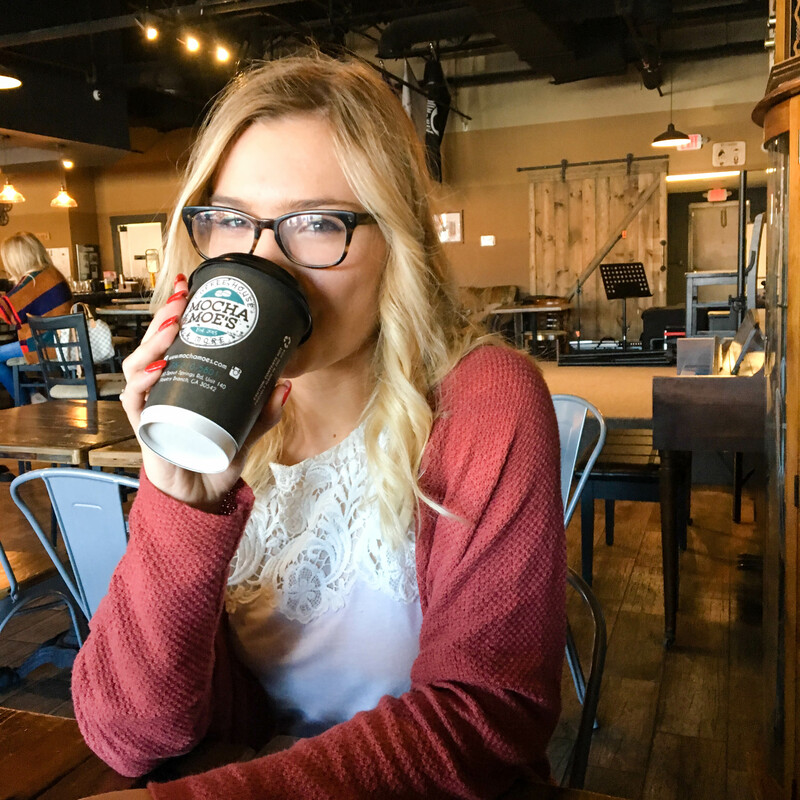 Alright, alright, it’s a bit ironic that I’m writing this post at this particular point in my life, because while it may be well-timed for college students gearing up for finals, I’ve had a pretty relaxed schedule these past few weeks. Right now, I’m alternating between doing work for the pool company I used to work for and studying for the LSAT, and as someone who thrives on a busy schedule, I’m not accustomed to this kind of freedom. However, for those of you who are still in the full swing of academia, this one’s for you. Your schedule can be as minimal or as detailed as you want it, but having a schedule in front of you documenting due dates and what tasks need to get done when is essential for maximizing productivity. Personally, I thrive off of a packed schedule, so even on days where it seems like I have nothing to do, I still try to work off of a self-made schedule to keep myself disciplined. It’s probably more of a Type-A thing, but I swear that one of the most satisfying feelings in the world is checking an item off of a to-do list. I keep my to-do lists in my bullet journal, right next to my schedule, but this is another area where you can really do what you want. I know a lot of people really love setting out their top three intentions for the day and using that as their to-do list, because it provides a clear sense of what the most important things are. I also know people who list off every miniscule task possible on their lists, because they like being able to feel like they accomplished a lot at the end of the day. 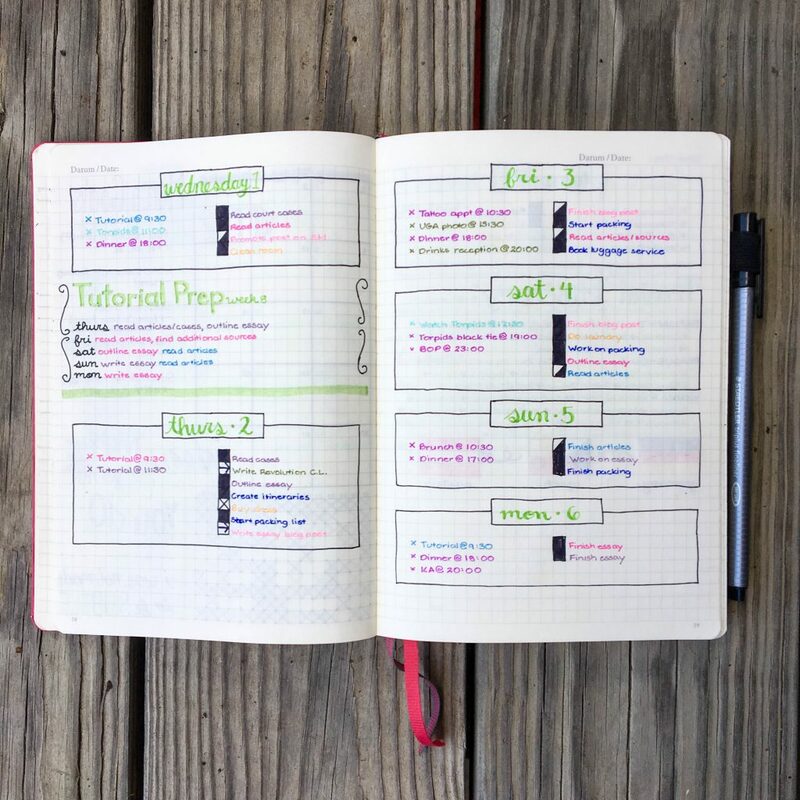 Regardless, combining a schedule and a to-do list provides a top-notch organizational system that allows you to really focus on getting things done. If you tell yourself you’ll study for six hours straight, there’s honestly no way you’ll end up being productive for that entire time. More than likely, you’ll find yourself an hour deep into weird Buzzfeed articles or YouTube videos with no idea how you even ended up on that topic of interest (No? Just me? Cool). Taking breaks from your work is healthy, and well-structured breaks can help prevent that spiral of distraction/procrastination. 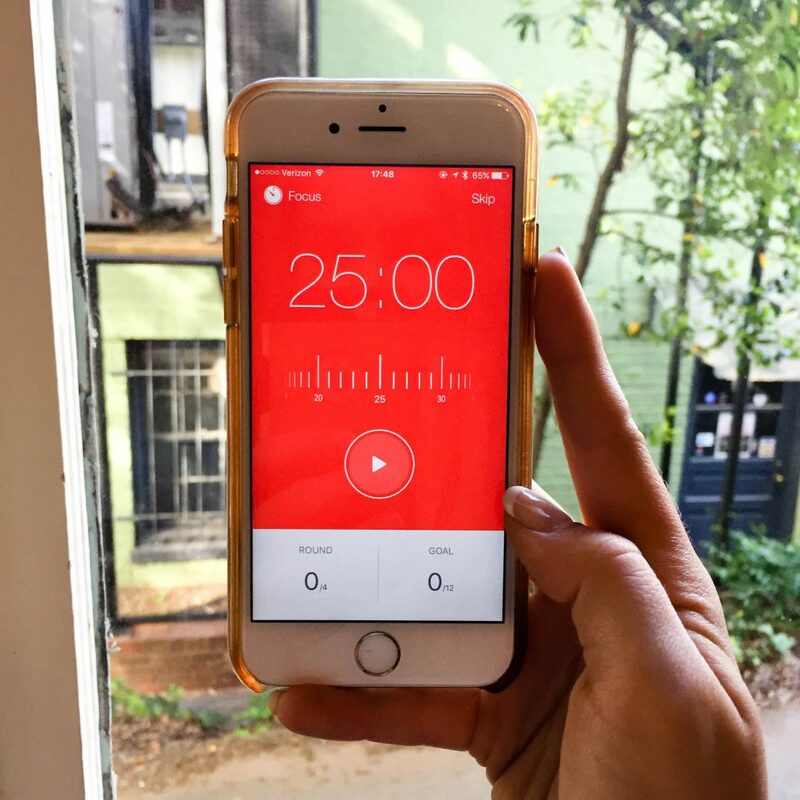 I absolutely love the Focus Timer app, which runs on a system called the Pomodoro Method. A friend introduced this to me while I was in Oxford and now I’m hooked. Essentially, the structure is this: you work for 25 minutes, then take a 5-minute break. Every fourth break, however, you get a full 25-minute break. This allows you to get distracted briefly (I almost always use my 5-minute break to check my Snapchats/text messages/Instagram) and then take a longer break as well. It’s great because you don’t burn out as easily as you might if you try to tackle a task with no breaks. You’re not going to function productively if you’re hungry, tired, or jittery, at least in the long term. I occasionally do this thing where I drink a copious amount of coffee at 10 p.m. and am the most productive person on the planet for a solid five hours before I end up laying on the floor at 3 a.m. questioning my entire existence. It actually works surprisingly well as a one-time deal, but it’s not a sustainable life strategy if you try to pull it off on a nightly basis. If you’re going to be stupid like that, limit it to once a week or so. The rest of the time, get a decent amount of sleep, eat regularly (and not junk food), and maybe don’t drink 5 cups of coffee in one sitting. If you don’t take time out of your schedule to do fun things, you’ll inevitably burn out and spend 2 full days binging Netflix and getting nothing done. So instead of working yourself to the ground, take time for the little things that’ll leave you refreshed and less likely to burn out. 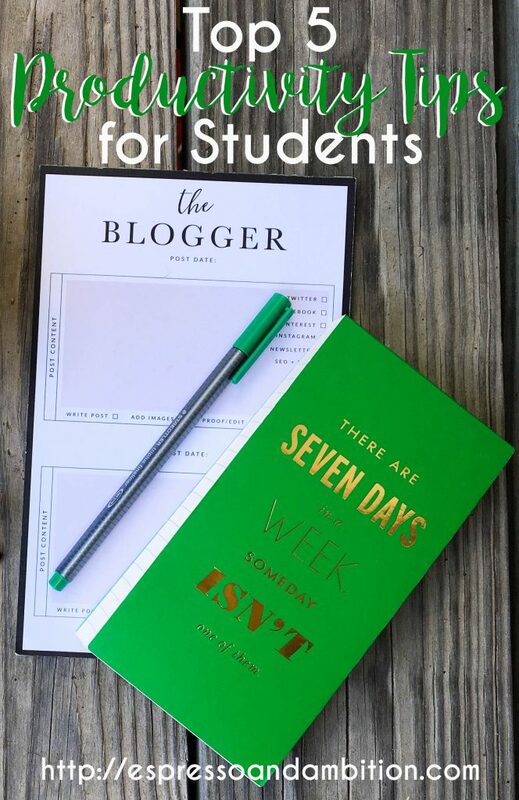 If you need some ideas, check out my post from December on how to manage finals week stress. There you have it: some of my top tips for keeping your productivity levels high! Let me know in the comments if you use any of these or if you have any additional tips I should know about – I’m always looking to get better at this.